In my 18+ years in the IT Industry, I have seen many changes. 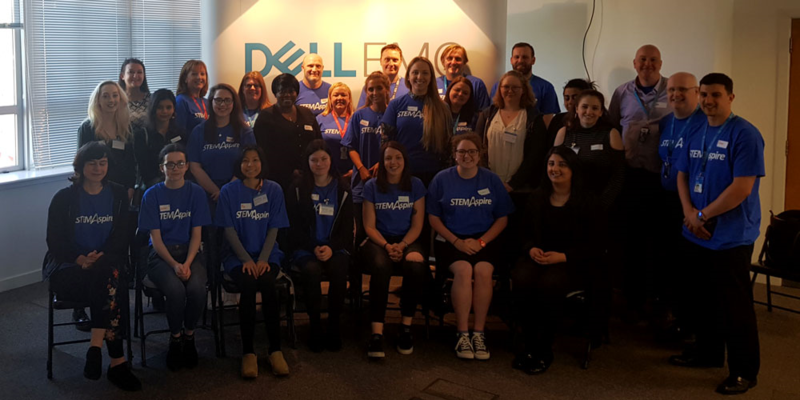 The most impactful change is the focus on Women in IT and the inspiring women who drive this diverse and inclusive agenda, so needless to say, it was without thought I wanted to be involved in the Dell EMC Glasgow STEMAspire program. It is indeed a real privilege being a Mentor and I am lucky to be aligned with a great mentee, Vardah Malik, who is keen to learn and keen to stay in the IT industry. Vardah is about to finish her HND in IT at City College Glasgow and wanted to either move into work in IT or to further study technology or web design at University. We have spent many hours working through her University application, her personal statement and browsing through the courses of interest. I have introduced her to a network of supporters in Dell EMC as well as external Industry Leaders, we even set up time with a UK Director to allow Vardah understand his career journey in Web Production. What has been most interesting is working with Vardah on the Social Media campaign around the STEMAspire initiative. We have learnt a lot together about social media platforms, the guiding rules around representing Dell EMC online, what makes a good blog (I’m still getting the hang of that!) and how to storyboard and make an animation come to life – check out the links below, and please share the start of our journey on your own social media platform. The STEMAspire program not only offers one on one mentoring support, but also the chance to get together as a group at arranged events. The latest one in the Dell EMC office in Glasgow was a real success. Read about the key speakers, workshop agenda and highlights of the day. With the agenda set, speakers confirmed and workshop content ready to go, the Dell EMC Glasgow STEMAspire workshop was ready to rock, inspire and guide our visiting mentees and guests. We were then treated to a few key guest speakers talking us through their career and lending some golden nuggets of advice. Take a look at their LinkedIn profiles below…. Both speakers focused on the importance of Networking and grabbing an opportunity when it arises! After a short lunch break, the workshops kicked off. I was delighted to be a presenter in the first of the 2 planned workshops on Hire-ability. The hire-ability workshop came in 3 parts. Firstly, Debbie Fraser of Talent Acquisition took us through the important do’s and don’ts of CV writing, from making sure your CV has 2 pages, making it punchy, displaying your skills, metrics and achievements. Ian Capperauld was the second speaker for the Hire-ability workshop and focused on “Thru the Lens of a Hiring manager”, which for some mentees, who are students, was a great insight into the preparation for a job interview, the common characteristics that hiring managers seek in a successful candidate and the enthusiasm that should be displayed. The last part of the Hire-ability workshop, which I presented, was about Personal Brand. This short and interactive piece was about how to develop your personal brand statement and how to manage your Online brand. The STEM students were really engaged with the activity in selecting well known “celebrities” and telling us about their public brand and were given homework to go away and develop their own personal brand statement for future discussions with their Mentors. After a short comfort break, the mentees gathered for the second workshop – Confidence building. This was an excellent workshop around Barriers to confidence, tips for overcoming challenges and then a great exercise on building your elevator pitch. So, how do you overcome confidence challenges? Its all about the positive and the preparation. The team gave some great handouts around Self Esteem journal, gratitude exercise and assertive communications. The STEM Students had 10 minutes to prepare their elevator pitch and a selected brave few stood up and gave their pitch to the whole group. I was delighted that my mentee Vardah took the bull by the horns and went for it! All in all, it was a successful event and the first of many to come throughout the course of the STEMAspire program. The hope is that the STEM Students could take away some key life skills and knowledge and also some new contacts within Dell EMC that they can reach out to in future. The feedback received so far on the event is very positive and our Mentees left feeling inspired and motivated to take control of their next steps in their journey. I’d like to thank the amazing DELL EMC team in Glasgow for their dedication, hard work and for driving this very important agenda within the industry. They are a team to draw inspiration from and a real pleasure to work with.